"Building a successful career in the life sciences field requires that you regularly measure and strengthen your professional value. But personal development is particularly challenging within this sector. Now more than ever, you need a detailed plan designed to help drive your career forward," states Wright Avenue Partners CEO and Founder Bill Donovan. In this paper, Bill provides 10 steps to improve your professional value progressively by strengthening your career strategy. Read the full white paper below. 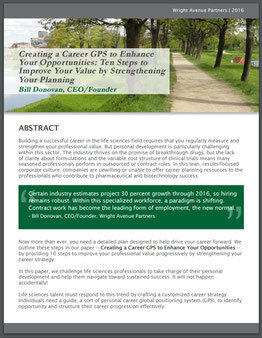 Click here to download Creating a Career GPS to Enhance Your Opportunities: Ten Steps to Improve Your Value by Strengthening Your Planning by Bill Donovan.